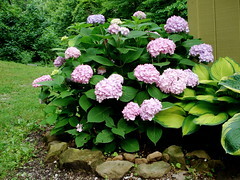 You don’t need a green thumb to grow hydrangeas, so why not plan to plant a new shrub this Spring. With just a bit of knowledge, you can have a beautiful and long lasting addition to your landscape in the form of big gorgeous blooms. Once you’ve made the decision to add a hydrangea to your yard, find out which type you’d like to grow and if it is right for your planting / climate zone. There are many varieties and flower types. Most are shrubs but some can be little trees, such as the Pee Gee, so know what you are buying. Decide where you will plant it by searching for a spot in the yard that is free of tree roots and has plenty of sun. Also remember that the plant you buy will grow to be around four feet across (depending on the type you choose) so allow space for it to expand over the years. Choosing a color can be tricky since some hydrangea flowers will change color according to the acidity of the soil they are growing in. The beautiful blue blooms you see when you buy a potted plant could change to pink if your yard soil is more alkaline. Water is especially important when a plant is young or has just been planted. Make sure the potted plant you buy has not dried out and once you remove it from the pot, if the roots are wrapped around each other, gently loosen them so they will spread out and grow normally once in the hole. If your soil is full of clay and not porous, add lots of organic matter when planting or your shrub will drown. Clay soil does not let the roots breathe, and holds excess water which can rot the roots. If you have heavy, clumping soil, you must amend it with your own compost or store bought organic matter to get the best results. See soil examples and read more at the Healthy Gardens site where they talk more about preparing your garden for planting. You can scale it down to include only the area where your new shrub will be living. Buy your shrubs from a reputable garden center and be sure to read the tag and/or pamphlet that comes with the plant. Some nurseries will guarantee their plants for a year, but most won’t since the buyer could be the one who causes it to die by improper planting. With little effort you’ll have a flowering shrub decorating your landscape for years to come and hydrangea flowers are long lasting. Use them in bouquets or in dried arrangements or wreaths. To learn more about changing the color of your hydrangea flowers (or why it may change) read this comprehensive page at the Hydrangeas Hydrangeas site. Previous Post Are We Gardening Yet?